In the spring of 2015, on 28 May, the discontinuation of Twilight ExpressW was announced. Twilight Express is a sleeper express which runs the longest distance (from SapporoW to OsakaW) in 22 to 23 hours. Moreover, the discontinuation of two other sleeper trains HokutoseiW and Cassiopeia (train)W will also be considered, both of which run between Sapporo and Tokyo overnight. This is because ShinkansenW, the super express trains developed with accumulated wade range of Japanese technologies, will be ready to connect SapporoW and AomoriW in two years. 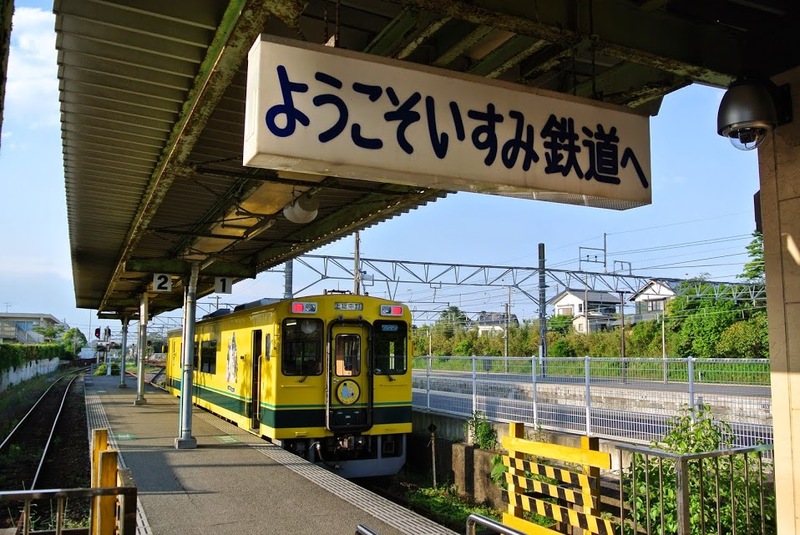 At Aomori, it will be connected to another Shinkansen, Tōhoku ShinkansenW, which means that we will be enjoying a long journey of 1200 km (745 miles) in less than four hours. Some people should be… The time they have to consume for the transportation will be a great waste for them. We agree. 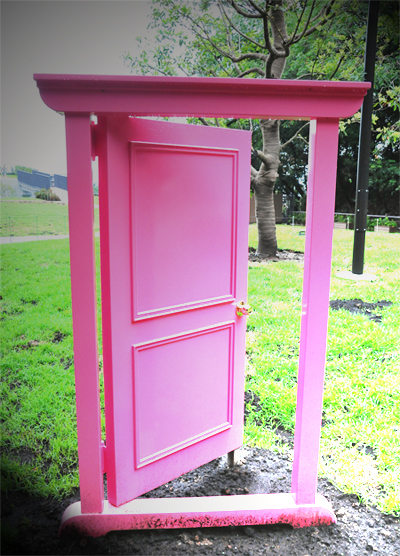 We sometimes are lead to crises in which we crave only for “Anywhere Door,” a door that opens up to any place we wish in seconds, one of the greatest gifts of DoraemonW. However, if we look at the Kanji which stands for ‘busy’, we realize that being busy can mean losing our heart or spirit. The left part of this Kanji means ‘heart or spirit’ and the right part means ‘to die or to loose’. By the way, have you ever heard of the Japanese word, ‘Tecchan’ (with accent on the first syllable)? It is written as 鉄ちゃん in Kanji. ‘Tetsu / 鉄(てつ)’ stands for iron and ‘chan / ちゃん is a suffix after a name which expresses friendliness. However, it has nothing to do with metallic fetish or steel manufacturing. Tecchan is a noun given to people (mainly male) who love trains, named after the ‘Tetsudo / 鉄道(てつどう)’, meaning railroads or railways in Japanese. The Japanese word for ‘train’ literally means the iron road. There are many ways of expressing their love to trains but there are mainly two types; the ‘Tori-tetsu / 撮り鉄(とりてつ)’ and ‘Nori-tetsu / 乗り鉄(のりてつ)’. Tori-Tetsu are those who love taking pictures of trains, on the other hand, Nori-Tetsu are those who love getting on trains. Ohara station. The signboard says “Welcome to Isumi Railway”. We normally use our car as a means of transportation in our daily lives even though more than 60 railways exist in Tokyo including subways. We didn’t like taking trains just imagining a famous rush hours in Tokyo. Isumi Railway taught us that our prejudice against trains were wrong. Yes, not all the trains are crowded. 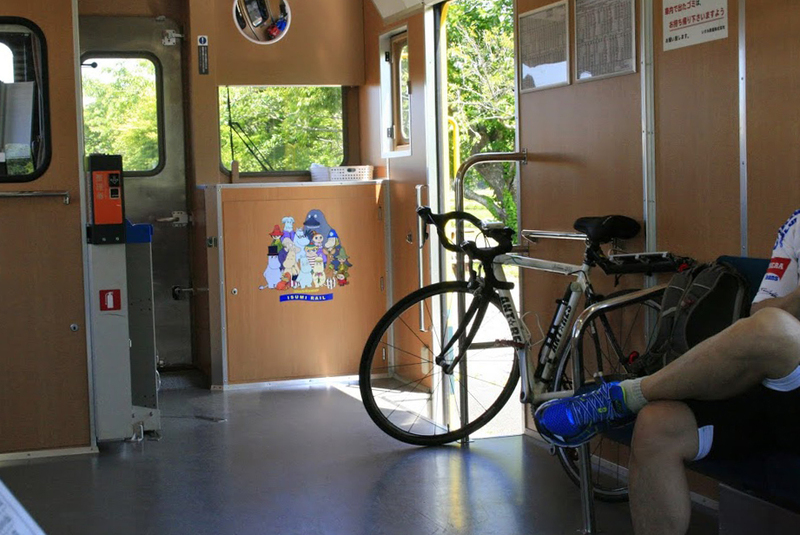 We fell in love with this single-car train running through beautiful sceneries of Isumi-shi, full of nature. It also made us to become Tetsuko / 鉄子(てつこ), female version of Tecchan. 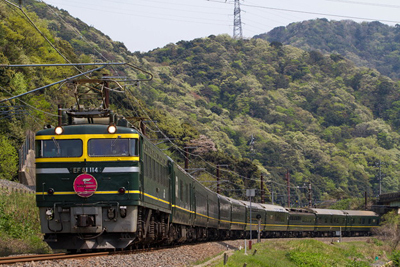 Before going to the detail we would like to share a brief history of Isumi Railway. Isumi Railway should be closed if the current account deficit would not be improved in 2009. It was in 2009 when the new president was selected through public invitation, who put many innovative ideas into practice to protect the railway and to make it even more attractive. The Moomins are living together in harmony. The Moomins are living in a country full of nature where there are mountains, woods, valleys, rivers, fields of flowers and the ocean at some distance. The location really resembles Bōsō_PeninsulaW where Isumi Raiway runs. 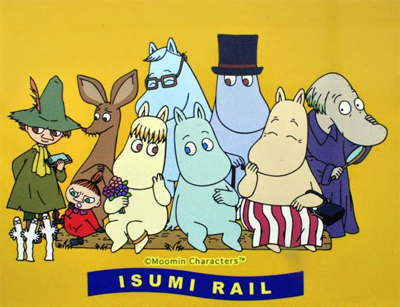 The story of The Moomins tells a philosophy of life and is not just an anime for kids. His wife loves the Moomins. At Kazusa-nakano station Isumi Railway is connected with Kominato Railway, another interesting railway that runs in Chiba. Isumi Railway runs between Ohara to Kazusa-nakano, only of 26.8km in length with 14 stations. There are three ways of purchasing a ticket; a ticket vending machine, ticket window or directly from a driver depending on stations. The best way to enjoy full of Isumi Railway is to get a ‘One-day Free Ride Ticket / 一日フリー乗車券’, an open ticket which enables you to get on and off the trains as many times as you want at any stations within a day. It costs you only 1,000 Yen. 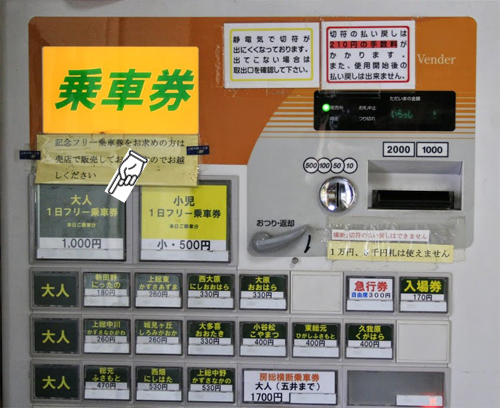 In case you don’t find a vending machine shown on right and would have to speak to a Japanese person, a driver on the train or a station staff at the ticket window, pronouncing the word slowly and clearly with emphasizing vowel sounds a bit, like “WAN DEI CHIKETTO” will make it easier for them to understand you. Easy! While travelling on Isumi Railway, the main site for tourists would be Ōtaki Castle (Chiba)W near ‘Otaki / 大多喜’ station. However, the best thing you can gain from this small and SLOW journey is a fair and pleasant countryside view. You can see various beautiful things which the nature offers. The inside of trains is, kept so clean. Beautiful as well as the outside view! 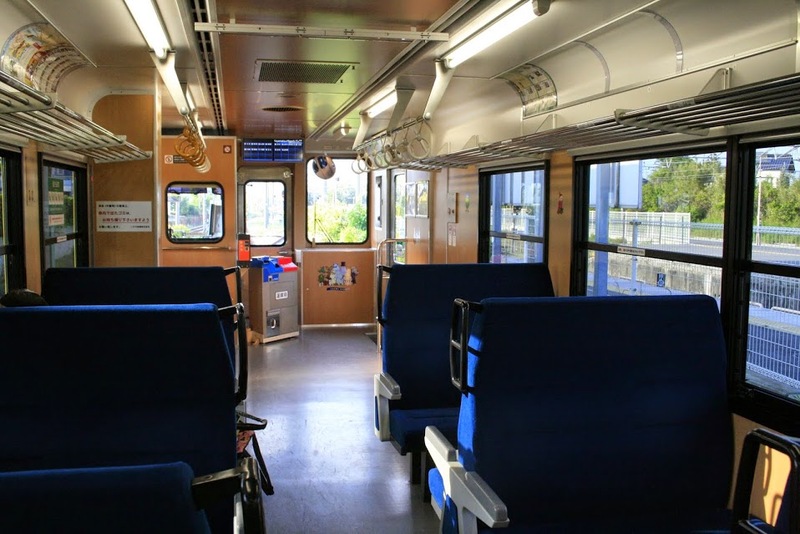 We would also like to emphasize that all the trains are kept very neat and clean even though some of the trains that they use are rather old, rare type carriages. 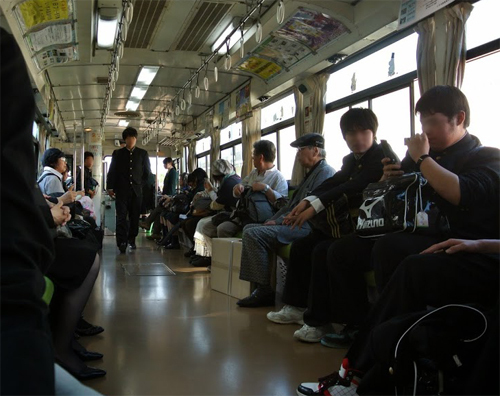 You will never feel unpleasant on the trains of Isumi Railway, which is a common problem for many trains in general. Recently, it was officially reported that many towns and cities in Japan will face the crisis of local train continuation in near future because young people head for cities, especially to Tokyo. 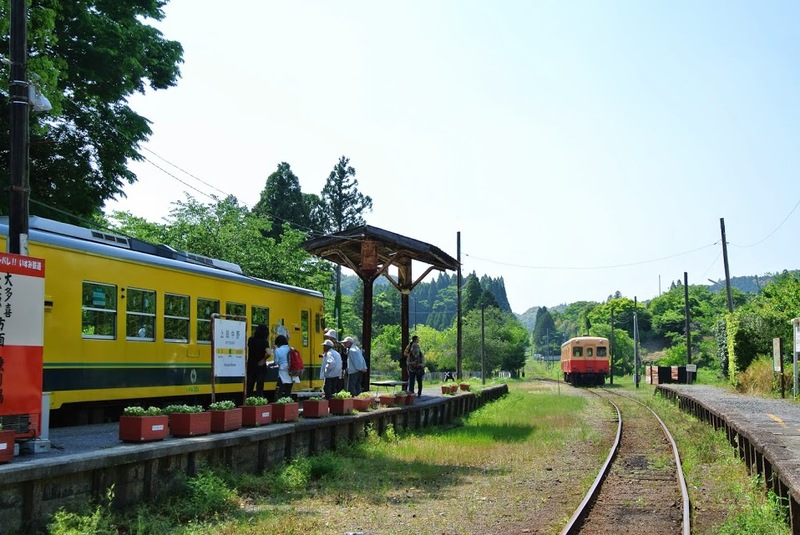 Isumi Railway is an important transporting method for students and local people who don’t have cars. Along with this circumstances, there were many railways that already have been DISCONTINUED because they were not economically viable. Specifically, less people live in the area and less people do not prefer to use these railway services like in the past as they have their own cars. We know we have to accept the law of Industrial Capitalism and we are not intended to deny it. However, we are afraid that the nature which does not create wealth by itself is facing a danger of extinction. If Environmental Capitalism should exist in parallel, we would not have to always search for the fastest transportation method. To reach your destination in short time would be important, but the process is more important at times. Isumi Railway was on the list of “endangered species”. But it was saved by people’s attention and love. The more people discover the hidden treasures within what were passed down from the anterior age like Isumi Railway, the less towns and cities would be on the Red List. Address (head office) : 264 Otaki, Otaki-machi, Isumi-gun, Chiba Pref. Parking : at Otaki St. and Kuniyoshi St. 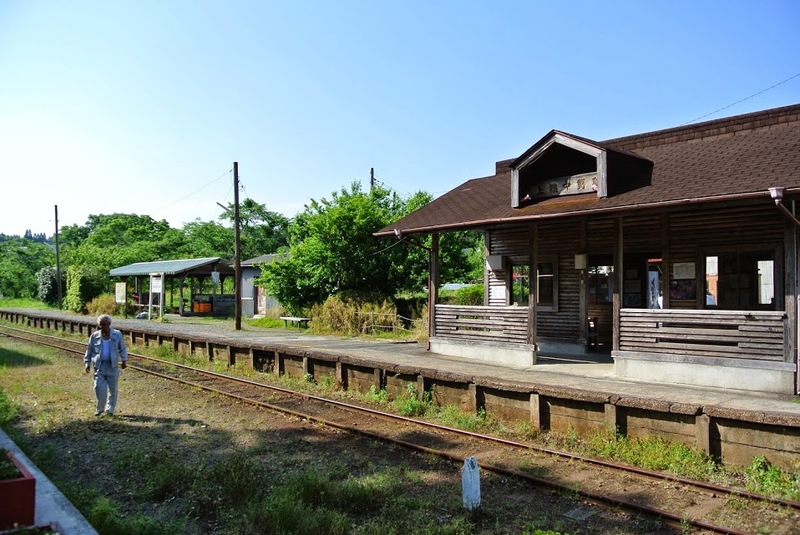 In the article Isumi Railway – A Star Only For Trainspotters? there is reference to a cheese maker in Isumi-shi, where is this cheese shop (?) located – would like to learn more of this CHEESE.